When homes are built, builders apply a water resistant coating outside the wall called parging. When your basement walls get cracks, so does the parging. Porous masonry absorbs moisture in through capillary attraction or wicking. This can cause isolated damp spots in your walls. When a wall is not too deep under the ground, it is possible to dig down by hand and apply a new coating on the walls. Use a product for basement crack repair that is capable of stretching, without losing adhesion, to keep up with any movement in the foundation. Read any product warranties and contractor warranties for this particular type of repair, to assure they properly stand behind their work. There are contractors who offer wall crack repair services which are done from inside the home. Some companies offer to inject waterproofing materials into the crack. Other companies can install a sealer material which is rigid in nature. This material would be installed in connection with an inside drainage system. The rigid waterproofing material would divert any leakage, down below the floor into a drain tile system. A benefit to this type repair is that, some of the waterproofing materials available can expand and contract along with the foundation, while spanning over cracks and other voids in the walls. Check any warranties offered on products and services to assure you have adequate coverage for the basement crack repair made. Blocked Rain Gutters - Blocked gutters cause all the water draining off your roof, to spill right next to your basement walls. A large amount of rainfall concentrated next to your basement, is the recipe for basement water problems. The soil next to your home becomes so saturated, water then takes the path of least resistance; your basement. Schedule your rain gutters to be cleaned twice per year, especially in the Fall Season, when the leaves have all fallen from the trees. If you have Pine Trees, you still need regular gutter cleaning because pine needles accumulate inside the gutters. 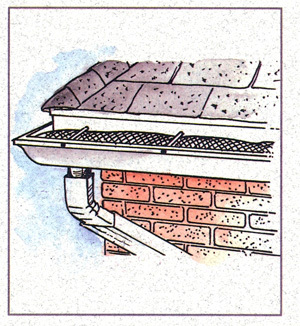 Get leaf guards installed to help keep your gutter clear of future problems. Extend Your Downspouts – Your downspouts should be extended to 10 or 15 feet past your foundation. Have them empty on top of the ground in an area that pitches away from your property. Don’t bury them under the ground, connected to dry wells. Dry wells will fill up with water and cause your gutters to back up, dumping large amounts of water right next to your basement. 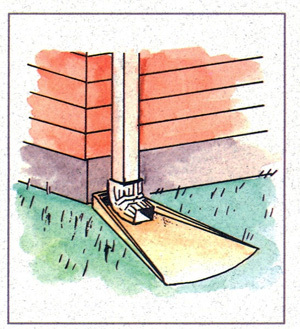 If you do extend your downspouts underground, let them drain out on top of the yard surface, over the side of a slope. Periodically check to make sure the ends of your pipes are open and clear of debris. Land Sloped Towards The Foundation – If the yard area is pitching towards the home, you are inviting all the surface water to collect next to your foundation. The soil then becomes over saturated and causes water buildup against the basement walls, causing them to leak. Recommendations Find a landscaping contractor to re-slope the surface of your yard away from the foundation. Sometimes, a continuous lower surface area can be made, like a shallow creek, to direct water to drain around your home and away. This is called a swale. By reducing any water accumulations near your home, you are also reducing the likelihood of basement leakage. Planters or Retaining Walls Holding Water? – Look outside the problem areas. Check to see if you have raised planters or retaining walls in that area. 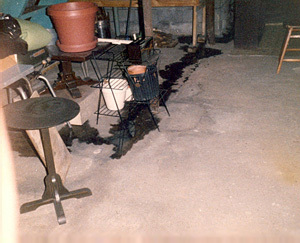 These minor structures can cause big problems for your basement by holding and retaining water. They can cause water problems in your basement. Remedy – You can try drilling weep holes at the base of raised planters, etc, to let water drain out of the bottom. If this doesn’t work, it might be best to completely remove these structures and make sure the finished grade of your yard, pitches away from your home for good drainage.